The Corolla horses that roam the beaches of North Carolina’s Outer Banks are an iconic sight and almost as much of a tourist draw as the beaches themselves. But these horses face an uncertain future as their herd size is at a level that the Corolla Wild Horse Fund says is too low to maintain adequate genetic diversity. U.S. Representative Walter Jones (R-NC) introduced H.R. 126, the Corolla Wild Horses Protection Act in January of this year to increase the size of the Corolla herd allowed by the National Park Service. Presently the herd is capped at 60 members, and the bill would increase the numbers to a minimum of 110 or a maximum of 130. On Monday, June 3, the bill took a big step forward when it was passed by the House of Representatives. The Corolla horses are a particular herd of North Carolina’s Banker breed, believed to be descendants of horses left by early Spanish explorers. In 2010, North Carolina designated the wild Colonial Spanish Mustang, as its official state horse. The American Livestock Breeds Conservancy classifies the Banker strain of Colonial Spanish Mustangs as critically endangered. Watch this segment of the FEI’s Equestrian World featuring Corolla Horses. 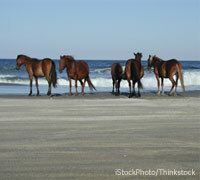 The next step for the Corolla Wild Horses Protection Act would be to move to a vote in the Senate. Last year, the same bill passed the House of Representatives but was never brought to a vote in the Senate. Learn more about the Corolla herd at CorollaWildHorses.com. Previous articleHow will federal budget cuts affect the BLM Wild Horse and Burro program? Didn’t know there was wild corolla horses, now i hope they win.